The theme of the 40th Anniversary is AllUsWe, a nod to the 1970’s USC Black student run publication. AllUsWe is being used to recognize the student activism and perspectives that shaped the formation of the center and to continue to empower students today. Our final event to celebrate our 40th Anniversary and to kick off Black History Month is the launch of our inaugural film festival F.R.O. Fest (Films Reflecting Ourselves Fest). F.R.O. 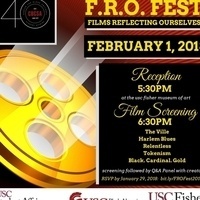 Fest recognizes up and coming Black writers, producers, and directors at USC. This inaugural festival will feature a total of 5 films including 4 student films (5-7 minutes each) and a feature short, Black. Cardinal. Gold. -- documentary about the history and experience of Black students and the CBCSA. Current and past CBCSA leadership will also be acknowledged at the event.